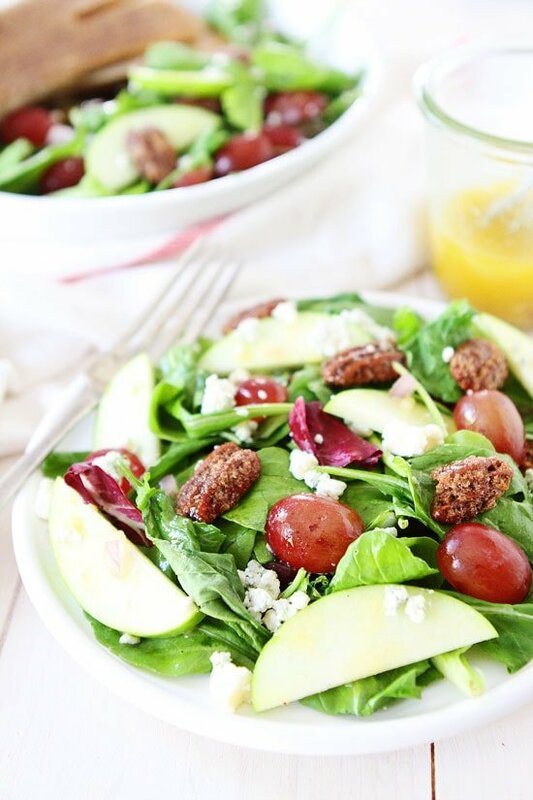 Apple, Grape, and Candied Pecan Salad with Maple-Mustard Dressing-this simple salad goes great with any meal or is even delicious enough to be a meal! One of my go to salads is this Apple, Grape, and Candied Pecan Salad with Maple-Mustard Dressing. 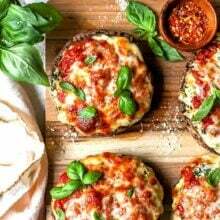 It always hits the spot and goes great with any meal…and sometimes it is my meal! I guess I just love everything about this salad. All of the flavors combined create one amazing salad! I could eat this salad every day and never get tired of it. 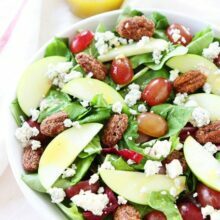 If you are looking for a new salad recipe, give my Apple, Grape, and Candied Pecan Salad with Maple-Mustard Dressing a try! I think it would be a fabulous addition to your Thanksgiving menu. And I bet if you make it for Thanksgiving your friends and family will beg you to make it for Christmas too. Everyone loves this salad! This salad is great as a side dish or main dish. It goes great with any meal! 1. To make the Maple-Dressing, combine olive oil, shallot, garlic, mustard, vinegar, and maple syrup in a small bowl. Whisk together and season with salt and black pepper, to taste. 2. 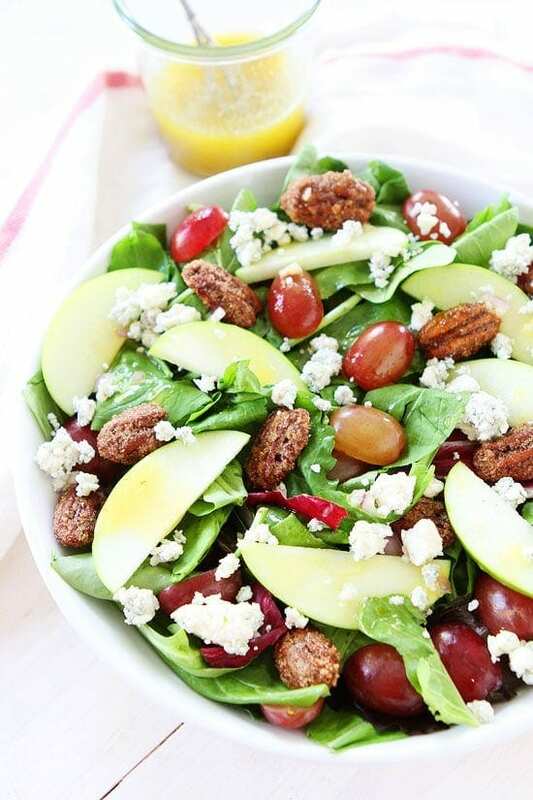 In a large bowl combine salad greens, apple slices, grapes, candied pecans, and blue cheese. Drizzle salad with dressing and toss to combine. Serve immediately. Note-if you aren't a blue cheese fan, you can use feta or goat cheese! Positively delicious! I love everything about this salad! You say candied pecan and I am ALLLL IN. Especially with all the cookies I have been testing lately, this girl needs a little (a lot) of greenery in her life! Pinned! Love this perfect salad! These flavors are so mmmm!! I’m all about balancing out my cookie consumption with a few of these gorgeous salads. Love! I love fresh salads at this time of year and this one looks delicious! I like your idea: eat salad now so you can splurge on cookies later! You’re totally making me crave salad…and that’s a good thing. Love the combo of flavors here. Pinned. 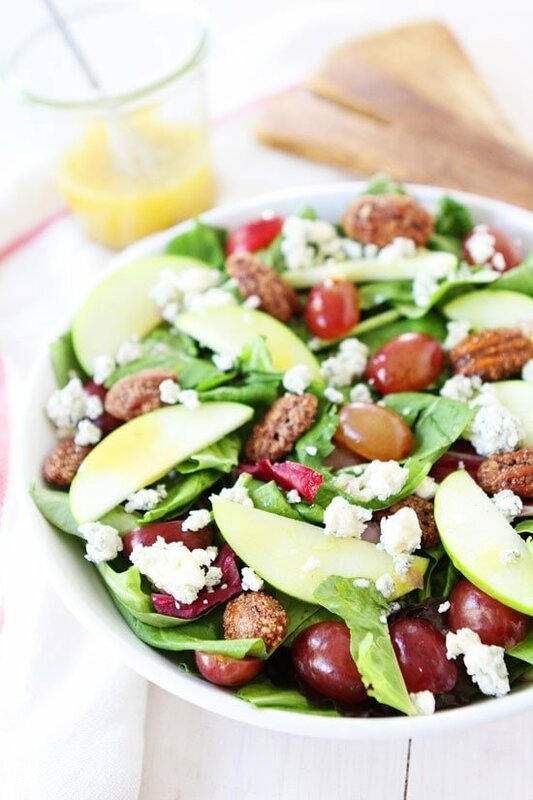 I love the candied pecans on top of this salad! It gives it that special oopmh! Yum! This salad looks so healthy and fresh! Love the idea of adding the pecans for some extra sweetness and crunch. I love that we can substitute feta for the bleu cheese. This salad looks amazing! 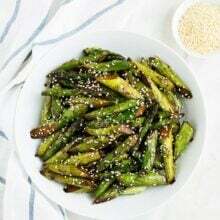 It would be a great side dish for Thanksgiving too. This salad has my name all over it. I basically make a rendition of this every time I make a salad and struggle with straying from that salad or my favorite kale salad because it’s just so good. I have yet to make a maple-mustard dressing though and need to try that asap! 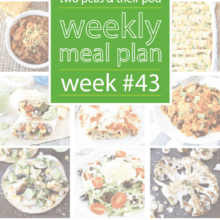 I love salads and this one has a lot of my favorite ingredients! What beautiful photos! I love that this salad looks so fresh and healthy. Just in time to prep for cookie season! 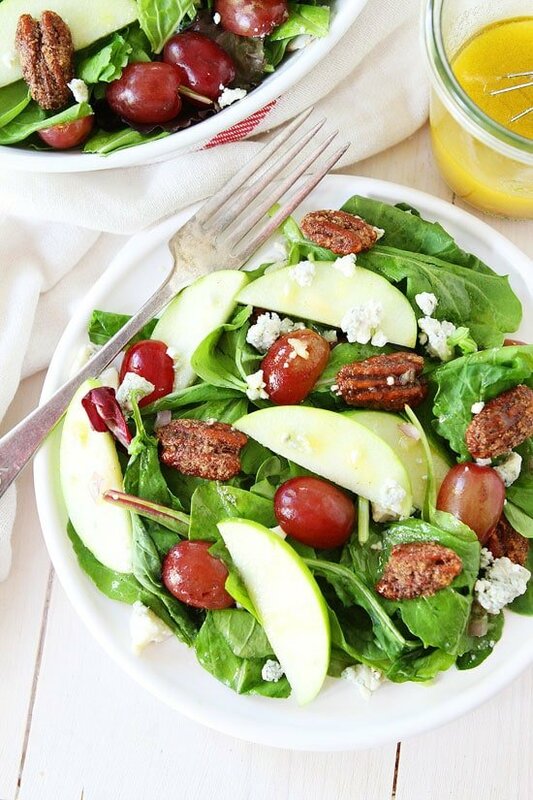 This salad looks wonderful, love the candied pecans! I want this salad right now! The combo of blue cheese and candied pecans sounds amazing!!! This looks like a salad that I had at the Delta Bessborough in Saskatoon. (It’s one of those refurbished CP Hotel buildings – very fancy and pricey). I think the salad was about $15! It’s been one of my favorite combinations since then, but I never could get the dressing just right. I will try yours for sure! The only difference in theirs is that it was crumbled goat cheese instead of blue. I like both, but the goat is milder so may be a better option for a big crowd. Thanks for reminding me of salad. I have been turning to comfort food since it turned bitterly cold here on the prairies. This look amazing! I know my family would love them. Kaçak su tespiti cihazlarımızla kaçak suyun nerede olduğunu kısa sürede bularak kaçak su sorununu ortadan kaldırmaktayız..
Hey! Do you make your own candied pecans? I’ve never done it, but I’m sure it’s not too hard! 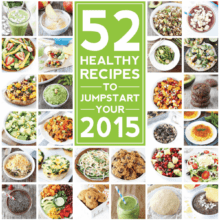 Do you have a recipe you love? Yes! These are the BEST! https://www.twopeasandtheirpod.com/candied-pecans/ Make extra so you can make our Candied Pecan Chocolate Chip Cookies too-recipe is on our site:) Enjoy! This salad is mouth-watering. 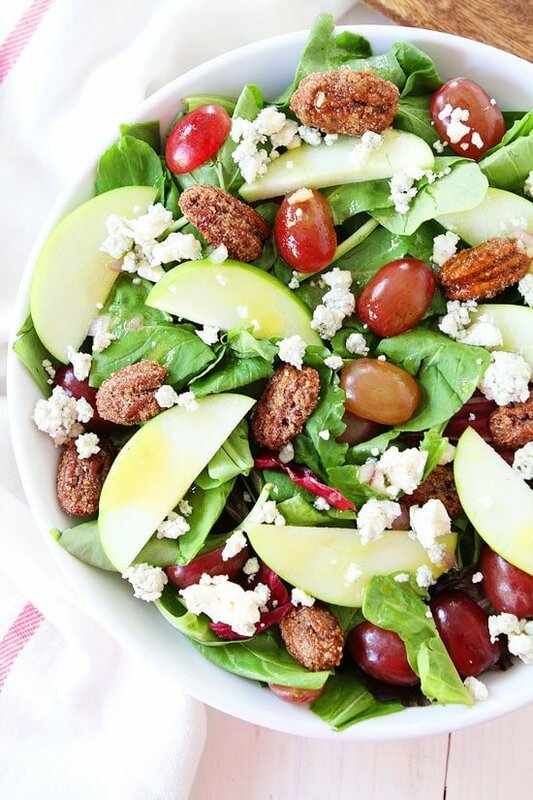 You are right this apple, grape, and Candied Pecan Salad with Maple-Mustard Dressing-this simple salad goes great with any meal.